"frustum." YourDictionary, n.d. Web. 12 April 2019. <https://www.yourdictionary.com/frustum>. The part of a solid, such as a cone or pyramid, between two parallel planes cutting the solid, especially the section between the base and a plane parallel to the base. 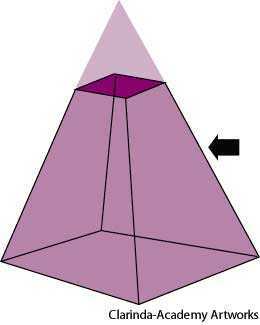 A cone or pyramid whose tip has been truncated by a plane parallel to its base. A region of a sphere delimited by two parallel planes. The spelling frustrum is erroneous, and is by incorrect analogy with frustrate, also of Latin origin. FRUSTUM (Latin for a "piece broken off"), a term in geometry for the part of a solid figure, such as a cone or pyramid, cut off by a plane parallel to the base, or lying between two parallel planes; and hence in architecture a name given to the drum of a column. Hence the area of an ellipse whose axes are 2a and 2b is Trab; and the volume of an ellipsoid whose axes are 2a, 2b and 2c is t rabc. The area of a strip of an ellipse between two lines parallel to an axis, or the volume of the portion (frustum) of an ellipsoid between two planes parallel to a principal section, may be found in the same way. The volume of a frustum of a cone, for instance, can be expressed in terms of certain magnitudes by a certain formula; but not only will there be some error in the measurement of these magnitudes, but there is not any material figure which is an exact cone. This pulley has fixed to one side, and concentric with it, a short frustum of a hollow cone.